Inman explains that she's using the MB (presumably Mother's Building) stationery because there is "a good bit on hand" and describes planning to send the MB exhibit with Inez to St. Augustine. She inquires whether there is any contact in St. Augustine through Martha Berry now. 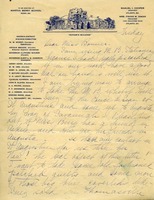 She indicates that the real object of her letter is to discuss old fashioned patched quilts which might be exhibited and sold.